DETAILS: When Iraqis misunderstood his soldiers' mission, this colonel urged his infantry to back off to keep from making enemies of civilians. NAJAF, Iraq (CNN) -- The soldiers were moving to the home of one of Iraq's leading holy men, the Grand Ayatollah Ali Hussein Sistani, seeking his crucial support for their stay in this southern Iraqi city. 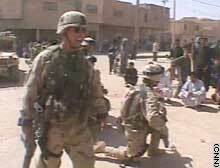 But as they turned a corner, a group of Iraqi men blocked their way. Shouting in Arabic, "God is great," the crowd grew into hundreds, many of whom mistakenly thought the Americans were trying to capture the town's holy man and attack the Imam Ali Mosque, a holy site for Shiite Muslims around the world. Someone in the crowd lobbed a rock at the troops, then another. Lt. Col. Chris Hughes, commander of the 2nd Battalion, 327th Infantry Regiment, showed restraint and intelligence. He yelled to his troops: "Smile, relax." Then he commanded his soldiers to take a knee and point their weapons to the ground. Some Iraqis backed off and sat down. But many more continued to yell and block the road. Lt. Col. Chris Hughes instructs his soldiers to get down on one knee and smile. "We're going to withdraw out of this situation and let them defuse it themselves," he told his troops through a loudspeaker. "All vehicles turn around." Not all commanders would have done it that way. But Hughes, 42, a career military man who lives with his wife, Marguerite, and three teenage children in Fort Campbell, Kentucky, kept his cool as two cultures almost clashed. Responsible for hundreds of soldiers, Hughes drew praise from President Bush for his "skill and honor." "This gesture of respect helped defuse a dangerous situation and make our peaceful intentions clear," Bush said during his weekly radio address. Nicknamed "No Slack," Hughes' unit is described by its official Web site as "a rapidly deployable battalion that is lethal, ruthless, violent, feared in combat." 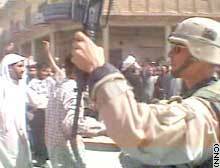 But on April 3 in Najaf, Hughes also made sure his soldiers understood cultural differences and the meaning of restraint. With his own rifle pointed toward the ground, the colonel bowed to the crowd and turned away. Hughes and his infantry marched back to their compound in silence. And when tempers had calmed, the Grand Ayatollah Sistani issued a decree calling on the people of Najaf to welcome Hughes' soldiers. "I've been real proud of him," his father, Dr. Patrick Hughes, told The Des Moines Register. "He is doing a good job over there like the rest of them are." Note: In every war there are acts of extraordinary courage where an individual, military or civilian, goes beyond what is expected to avert conflict, save lives or otherwise achieve an extraordinary mission. This special section highlights the acts of a few individuals who -- through feats of courage, nobility of purpose or life-risking situations -- have become "Heroes of War."